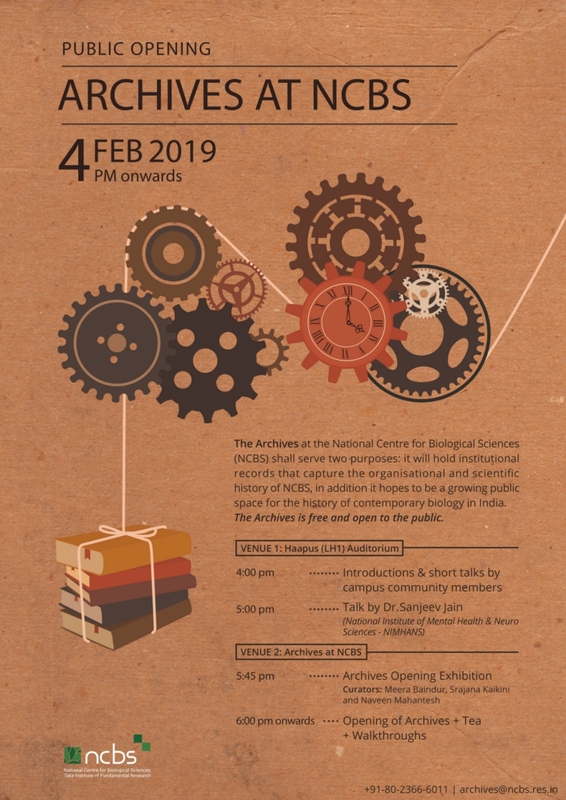 We are thrilled to announce the public opening of the Archives at NCBS on Feb 4 2019, starting at 4pm. We are located in the Eastern Labs Complex (ELC) basement. The Archives at NCBS aims to be a collecting space for the history of contemporary biology in India. Come on down to read a rare book, see elegant custom-built tools, browse the catalogue of over 50,000 objects, or just wander around the new space and opening exhibition. A detailed schedule is in the poster below. The Archives is free and open to the public. For more details, contact us at +91-80-2366-6011 or archives@ncbs.res.in. See you in the Archives!